Many Canadians are including “superfoods” in their diets these days. These foods are more accessible than ever, they taste great and they can easily be integrated into your diet. A superfood is a food that is particularly nutrient-rich and beneficial for your health and well-being. Since these foods tend to be more nutrient-dense than other foods, they will help you feel better. They are rich in things like antioxidants, vitamins, and they contain healthy fats, all things that help you stay healthy and fight the flu and colds during the winter. One of the best-known superfoods is the pomegranate. Pomegranates have become popular over the past decade, since becoming available as a tasty juice that you can get at almost any supermarket. Include it in your favourite beverage, or a smoothie and in many other recipes. Plus, it tastes great! This popular superfood is a true berry that is about the size of an apple or orange. Below the thick and reddish skin of this round fruit are 200 to more than 1,000 small seeds, immersed in a watery pulp. Their odd appearance and the fact that they’re tricky to eat explains why pomegranates did not become popular until they were sold as juice. It’s one of the few fruits whose juice has just as many health benefits as the fruit itself. Pomegranates are a superfood, because of their high level of antioxidants. 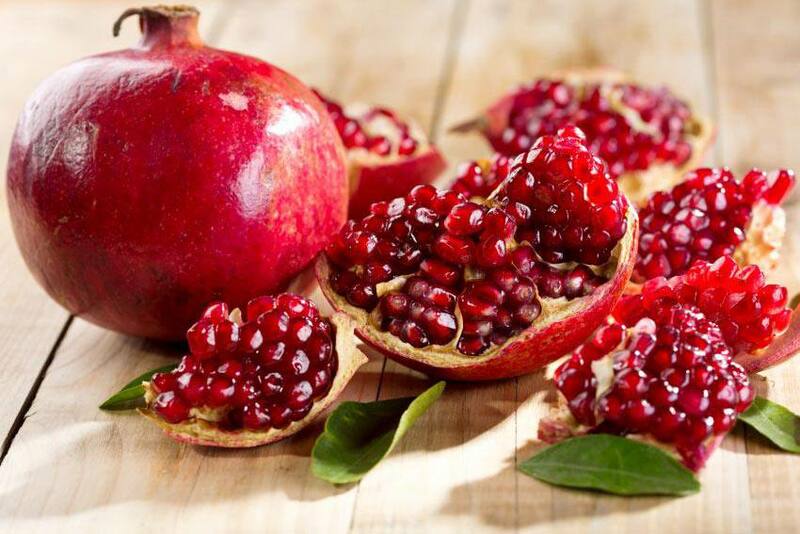 In total, pomegranates offer more than 20 vitamins, minerals and electrolytes, and are a great source of vitamins A, C and E, as well as minerals, such as calcium, iron, folic acid, and potassium. Studies and clinical trials are being conducted to examine the potential benefits of pomegranate consumption and its effects on health issues such as prostate cancer, diabetes, memory loss, aging, male infertility, kidney disease and even the common cold. Learn about the benefits of other superfoods by reading Prepare for winter with superfoods. Vegan, gluten-free, paleo and vegetarianism: Diets or lifestyles?